The Terralite Portable backpacking chair can be compared with your favorite armchair, the one that knows just how to envelop you in one of those perfectly snug embraces – the difference is that this seat is happy to trot off to the outdoors and join you on even the most extreme adventures. Ticking all the boxes for being lightweight-ish (at 3 pounds), compact and perfectly comfy, the Terralite is also great value for money. One outstanding feature of this portable folding chair is the addition of the Terragrip feet which help to keep your chair from sinking in sand, mud or wet terrain. Apart from this feature, the chair comes pretty standard and remains practical and perfectly suited for hiking excursions. The Terralite sets up in seconds and folds to a compact size for convenient storage. Simply attach the chair to your backpack using the built-in Velcro straps for hands-free transport. 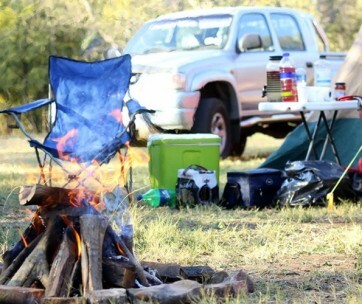 For more great chairs, make sure you also check out guide to the best camping chairs. Helinox definitely deserves a round of applause for their design innovation. Voted as the best outdoor adventure accessory at the ISPO awards in Munich, the Chair One’s lightweight material is further complemented by its compact design. Weighing in at only 2.6 pounds, this backpacking camp chair has been magically engineered to comfortably accommodate body mass up to 320 pounds! This is quite an astounding featuring considering that the chair packs down smaller than the Sunday Times. The Chair One is slightly on the pricier side when compared to your typical travel chair, but it’s rugged durability, compact size and light weight make it well worth the price. We also give this folding chair thumbs up for its aesthetics – it will look just dandy as it dangles gently from your kit. So pack your backpacking backpack and hit the trail! If you’re on a tight budget but don’t want to skimp on all the bells and whistles, then the Yizi Go is a viable option that won’t disappoint. Weighing in at only 2pounds, this lightweight folding travel chair is a perfect companion for all outdoor activities and just like the pricier brands, it folds up quickly and easily, making it a friendly addition to your backpack. One thing we really appreciate from this design is that it boasts three adjustable heights, allowing it to comfortably accommodate toddlers, kids, and adults alike. The YiziGo also offers a deep seat, so you can really sink right into it and put your feet up. Side mesh panels allow air to flow through the structure which helps to avoid sweat build-up on sweltering days – this is great because there is nothing more annoying than building up a sweat while seated. So, if you are on the hunt for a backpacking chair that is practical, reasonable in price and is ideal for the amateur outdoors sportsman (or happy camper), then you’ve found your guy. You can also combine it with one of the camping tables from our list. If packing light is your ultimate goal and you are willing to forgo a raised seat, then the HEX 2.0 is definitely worth the consideration. Weighing a mere 21 ounces, this fold-out design is probably the lightest backpacking chair on the market. While comfort might not be its best feature, the Hex 2.0 is appreciated for its versatility, durability and its brilliant way of folding out to offer an instant seat on any terrain. The seat’s inner 8mm high-density foam is covered with water-resistant and breathable 70D coated ripstop nylon, offering your buns padding while keeping moisture, sand and a bumpy terrain at bay. Holding up to 250 pounds, this lightweight portable chair proudly sports a bottom flap that folds in for extra seat cushioning or out for lounging (or you could fully expand it for added cushioning under your sleeping bag). The Hex 2.0 is a highly packable chair and with an added top loop you can easily clip it onto your backpack for quick access and simple convenience. Make sure you also check our guide to the best beach chairs. If you have a few extra bucks to spare and can appreciate an ingenious modern design, then you might want to add the Therm-a-Rest UNO onto your list of considerations. Packing into its own disc-shaped base, this lightweight backpacking chair has been uniquely designed to not only fit snuggly into your hiking kit but it also conveniently adjusts to just the right height for festival regulations. While the UNO chair is slightly heavier than other counterparts (at 2.1 pounds), it makes up for its weight in versatility. And if it’s not a seat you’re after but a surface, you’ll be impressed to discover that the structure converts into a side table for camping convenience. 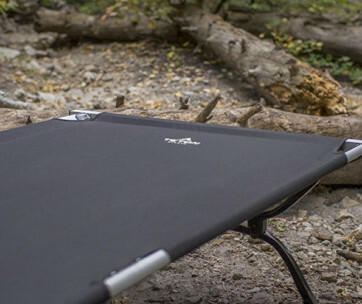 Built to withstand a body capacity of up to 250 pounds and snazzy design to boot, the Therm-a-Rest is the perfect companion for those who appreciate a little bit of style and comfort even during the most extreme outdoor adventures. And it also looks good in front of your backpacking tent. Before we get into the more general features, let’s take a look at what makes the Monarch Chair unique. With just two sturdy feet, this backpack folding chair not only lifts you to sit comfortably above ground but also allows you to rock back and forth, adding to the experience – quite a cool novelty feature, we think. It also fits into the category of being one of the lighter portable chair options, with an impressive weight of only 1.4 pounds. Alite has managed to do what very few other brands have battled to implement, which is to create a portable chair that’s fun and funky while remaining practical and versatile. While the Monarch might not be the sturdiest backpacking chair available, it’s comfortable enough for short-term seating, like taking breaks during a long hike or enjoying a sundowner as you relax on the beach under a popup canopy. We give it two thumbs up! While this design fits the bill for being more of a backpacking stool than a chair with a backrest, this low-cost outdoor seating solution still manages to keep your bottom cushy. Engineered to form the shape of a tripod, the seat has been structured to encourage you to sit straight, which is not necessarily a bad thing. And as lightweight and fragile as the stool might seem, TravelChair Slacker Chair can securely hold up to 275 pounds. This portable tripod stool conveniently (and easily) folds up to the size of a rolled-up newspaper, so it can definitely come in handy for those who are looking for a basic and lightweight seat to carry along on the odd outdoor excursion. In fact, the chair folds up to be so compact that it would fit snugly into your external frame backpack instead of attaching it to an outside loop (which is also still an option). If you are strapped for cash but really want to add a portable chair to your kit, then the TravelChair Slacker should make the cut. This robust chair makes camping look super sleek, not that that matters, really – or does it? 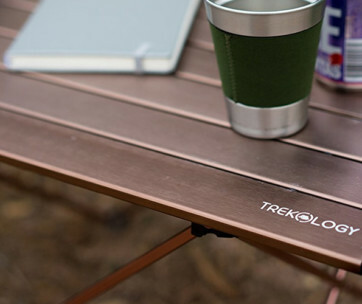 For instance, the heavy-duty aluminum frame boasts quite a unique and trendy color which makes it more aesthetically appealing than other similar camping and backpacking chairs. And while the chair weighs just a little over two pounds, it can accommodate up to a whopping 350 pounds of body weight! So, if you are a heftier fella on the hunt for a sturdy seat, then we encourage you to look twice at Sportneer’s portable chair. Look good, feel good – we say! An on-the-go chair that’s been made to last, Sportneer gets our approval for delivering a practical chair that packs easily and ticks the box for being ultralight. We also cannot fault the durable material that impressively conforms to the shape of your body and enhances the comfort – your bottom will thank you! We only have one gripe with this backpacking chair and that is that it takes slightly longer to set up when compared to other portable chair solutions. So take your camping mug, sit back in this chair and enjoy nature. Another tripod stool that really impressed us with its price, quality, and convenience is the ultralight backpacking stool from ALPS Mountaineering. There’s simply no beating around the bush with the brand’s Tri-Leg stool. 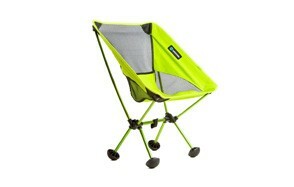 It’s light and compact enough to carry along on challenging hikes and its sturdy enough to offer an adequate seat. It’s just, well, practical! While a stool will never provide the same luxury as a fully-fledged chair, the ALPS Tri-Leg stands proud and offers enough comfort to give you the relief you need after a strenuous walk or climb. Packed complete with the usual storage bag, this backpacking stool folds down to a mere 3 x 24 inches. The tripod leg-structure and unique center support and webbing system make this lightweight stool sturdy and fully capable of holding up to 250 pounds of weight. Strength and stability are definitely the Tri-leg stool’s top-quality features. The Coleman Stadium seat is by far one of the more affordable backpacking chair options. While it might not look as impressive as other more robust and lifted seats, it’s perfect for those who are simply looking for a place to rest their bottoms without plonking them on the ground. This lightweight (only 1.2 pounds) portable chair is fully water-resistant and the durable fabric with its strong seams ensures that the product has been made to last. Simply roll the seat up and toss it over your shoulder using the carry strap or hook it onto your backpack – you won’t even know it’s there! Definitely well worth its value, we recommend the Coleman Stadium ground chair to those who are perhaps not as serious about camping or hiking. It’s best suited for those who like to attend festivals on the odd occasion or frequently find themselves on the beach. For a more seasoned hiker or camper, we recommend something a little more robust. If you really are just wanting something basic to plonk your tush on without getting wet and being overcome with a backache, then the Stadium seat will do just dandy. The Gear Hungry team believes that sitting back and taking in the view is all part of the outdoor adventure. While you might be skeptical about adding a luxury item to your already heavy backpacking kit, you could come to realize that the added comfort on your journey is worth it. Not to mention that these chairs are super light and you’ll hardly feel their weight. It’s for this reason that we made the effort to round up a list of our favorite portable chairs by taking their size, weight, durability, and comfort into consideration. Oh, and let’s not forget the price, since the budget is always a deciding factor! Fabric Material - Camping chairs need to be designed with the outdoors in mind. Seats should be made using durable materials that clean easily and are preferably water-resistant. Seams need to be strong enough to hold the pressure of body weight and the thicker the fabric, the better. Chairs that come with mesh panels allow the seat to “breathe”, which means you will be less likely to build up a sweat as you lean back in comfort. Frame Material & Design - Portable chairs should ideally be made using rust-resistant materials that won’t bend or buckle under pressure. Aluminum and steel frames tend to be the sturdiest option, although the stability of a chair also has a lot to do with how it has been engineered. Comfort - Apart from lifting your rear-end off the ground, one of the main purposes of a chair is to give you comfort and relief. If you find yourself with a rickety chair that leaves your bones and muscles aching, then it’s not really serving its purpose. Some camping chairs come with a padded lining but it’s more the design of the chair that determines its comfort. Weight - One of the main objectives of any backpacking chair is to weigh as little as possible. If you are looking for a chair for lengthy excursions where you will have to carry it from point A to B, then we advise you to make weight one of your priority deciding factors. Heavier portable chairs are more ideal for campers or festival goers who don’t mind lugging extra weight around for a short period of time. Weight Capacity - We want to avoid that dreaded scenario where we find ourselves falling through our chairs. This can lead to injuries and a nasty experience that we simply don’t want to wish upon anyone. So, when shopping for a fold-out chair, we strongly advise that you pay attention to the model’s weight capacity. Most chairs can withstand an average rate of 250 pounds while other chairs are strong enough to hold as much as 350 pounds of body weight. Packability - When it comes to picking the best lightweight backpacking chair, we can only agree that size does, in fact, matter. Hikers, happy campers and even festival goers prefer to keep their luggage light and it only makes sense for portable chairs to fold up to conveniently compact sizes. 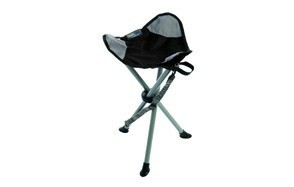 Chairs that roll up or fold neatly into a small bag are ideal for hikers who are short for space. Size shouldn’t skimp on quality or durability, however. So, the easier your chair can be packed without compromising its main purpose as a bottom rest, the better. Ease of Set-up - With some chairs, you simply pop them open and plunk yourself down – which is always a bonus. Other portable backpacking chairs, however, often come with multiple hubs and require a little more time and effort to set up. Chairs with frames that need more effort to connect tend to be sturdier with more “chair-like” attributes, although this is not always necessarily so. If you are using your chair for quick breaks whilst hiking, then you definitely want to opt for something that takes seconds to set up and packs away just as quickly. Foldable Chair - Foldable chairs do exactly that, they fold. When you extend them, they open up to offer a comfortable seat and when you close the folds, you are left with a compact device that’s perfect for packing and is usually lightweight enough to carry with ease. Most folding chairs do come with a backrest and are raised comfortably above ground-level. The frames can vary considerably but most resort to your regular four-legged chair shapes or feature X-shaped frames. Stool - Camping or backpacking stools keep you raised comfortably above ground. Most stools do not feature a backrest, which generally makes them lighter than foldable chairs. They also fold to a more compact size. Stools tend to sport a tripod frame with a triangular seat-rest, although they can, of course, come in other shapes and sizes. Stools have a knack for encouraging you to sit straight, which can be comfortable (and good for your back) but this also forfeits the luxury of sinking into a chair and relaxing. Ground Chair - Ground chairs tend to look like they are uncomfortable but when you sink into one, you will be surprised at how sturdy and accommodating they can be. They have no legs and the seat is placed directly onto the ground. This means that you will have to extend your legs as you sit and lean back into the backrest. Ground chairs have an inner padded lining and are usually made from very durable and water-resistant fabrics to ensure that you are kept dry as you relax and take a breather. Sometimes you get ground chairs that extend and they can then double up as padding for sleeping bags. 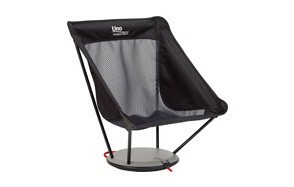 Seat Pad - The lightest and more affordable option for hikers and campers is a modest seat pad. While it comes without the bells and whistles, you’ll still have a cushy place to plonk your bottom on. In short, seat pads are cushions that have been designed to withstand the outdoors. They are usually insulated to keep the heat or cold from the ground at bay and they are also made from waterproof materials to keep you dry as you sit close to the ground. Some seat pads can also extend to be used as padding for under sleeping bags or they can also be used as a knee rest. They can fold or roll up to compact sizes and are the perfect solution if you are already lugging around a heavily packed backpack. Q: What kind of Backpacking Chair should I get? A: While it all comes down to personal preference, a chair that weighs less than 2 pounds and folds up to a compact size is what you should be looking for. Straps and hooks that allow you to connect the packed chair to the outer loops of your backpack are always convenient. If you are heftier in weight or size then you want to make sure the chair you choose can accommodate you. A seat that quickly folds out and in again is always a bonus. Q: What is the difference between Backpacking and Camping Chairs? A: If you are camping and don’t need to carry your gear too far then you can opt for a chair that has more accessories and is slightly heavier or larger in size. Camping chairs are designed to be the ultimate “chair away from home” and are usually more comfortable than your standard backpacking chair, which is purposefully designed to be compact and light so that it doesn't add much weight to your hiking kits. Q: How do I maintain my Backpacking Chair? A: Most portable chairs come with clear cleaning and maintenance guidelines. As a rule of thumb, you should never fold or store a chair when it is even the slightest bit wet as this often leads to a collection of mold or mildew. Steel frames can also rust if they are not dried thoroughly before being stored for a lengthy period of time. Backpacking chairs are commonly made from water-resistant fabrics and you simply need to give them a wipe with a damp cloth to remove dirt. Built-in stains can be removed using a fabric-friendly spot cleaner. Always keep your chair in a cool and dry cupboard when not in use as exposing it to weather for long periods of time could weather and tear the materials.